Porcelain Veneers Camden, London | Cosmetic Dentist | NW1 Dental Care. A veneer is a thin layer of restorative material bonded over the tooth in order to improve the aesthetic look of the tooth or protect damaged tooth. Porcelain veneers are used to make cosmetic changes to discoloured, chipped, or misaligned teeth. 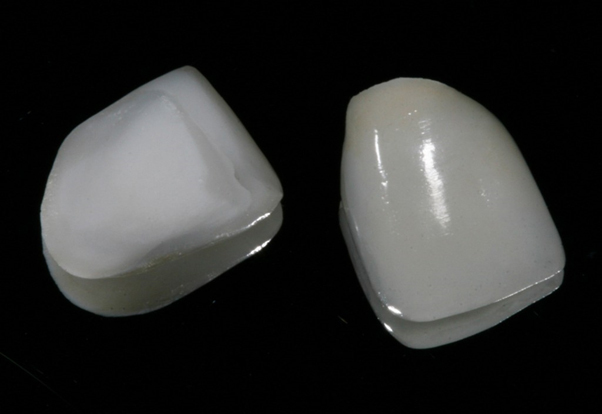 Basically, two kinds of materials are used in veneer treatments namely composite and porcelain. How much tooth structure is removed in order to place the veneers on the tooth? A thin layer, about 0.5 millimeter, is removed. The layer of tooth structure needs to be removed in order to make room for the porcelain. Also, grooves are made across the tooth in order to properly secure the veneer on the tooth. This way the veneers wont fall off and would have the proper contour without them being too bulky or have unnatural appearance. Whether your teeth are discolored or chipped, or moderately crooked, porcelain veneers will be a perfect solution for you. Take this quick and easy self-assessment. Look through the indications below to see if you might be a candidate for treatment. With the proper care, most dentists estimate that porcelain veneers last anywhere between 10 and 30 years. That said, they can fail early due to trauma or underlying tooth decay, so routine maintenance is essential. Get regular check-ups, brush softly with a non-abrasive toothpaste, and floss daily. Avoid using your teeth as a tool (no opening packages), which can cause veneers to fracture or chip. Make sure your dental hygienist knows you have veneers so they’ll use the proper polish technique during cleaning. Do Porcelain Veneers Look Fake? Individual results vary, but the goal is for the porcelain veneers to look and feel like a person’s own teeth, only better. To avoid the too-straight, too-white appearance that many associate with obvious veneers, intentional imperfections like slight rotation, subtle discoloration, and grooves can be made to imitate natural flaws. Because some tooth structure and enamel are removed prior to placing veneers, this is considered an irreversible treatment. Veneers may be replaced, but removing them for good will leave your teeth permanently scarred, at high risk for damage, and unhealthy looking. How long does the process takes? Getting veneers usually requires one – two visits over a ten days period. Veneers are created from an impression (mold) of your teeth that is then sent to a professional dental laboratory where each veneer is custom-made by hand for the Composite veneers (for shape and color) for your individual smile. The Zirconia / porcelain veneers however, are made by a computer and are much faster and thus, the procedure can be done in three – four days period of time, therefore only one visit would be needed for this choice. With the fact that temporary veneers are sometimes used in between the treatment process, will they look realistic, fake, natural different than the normal teeth? Also, will I be able to eat as normal? If you opted to have the composite veneers, then there is a two weeks period of time when you will have to wear temporary veneers. Reason being, these veneers are hand made and have a two weeks preparation time. The temporary crowns are one colour (white), look natural, and yes, you can eat as normal as before having the temporary veneers. However, we normally suggest to our patients not to take big bites into steaks or big sandwiches, because they are not so securely placed on the teeth, as we would need to remove them in order to place the permanent ones on the teeth. They sometimes last longer than 2 weeks, maybe for a few months, but are not designed to last very long. Also, you do not have to worry about it looking very white and fake, as this won’t be the case. Most of our patients go for a lighter colour veneers when the return to have the permanent ones put in place. Do I have to get my other teeth whitened after getting veneers treatment? 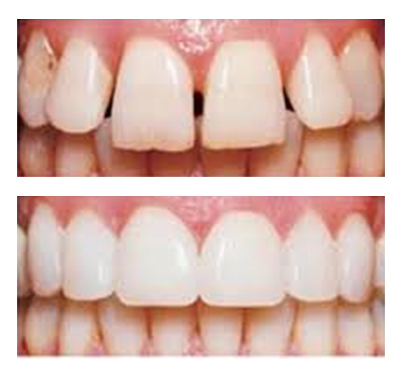 You do not have to get the other teeth whitened, as they just might match with the veneers. However, if you have discoloured teeth, then you can decide to have tooth whitening if you would like, but it’s not a requirement.